I love making treasuries on Etsy...and every Wednesday I am going to start featuring some of the items from my current treasuries into a collage for you to see! 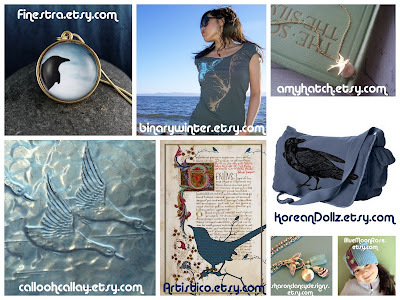 These are some of my favorite items featuring a lovely blue bird theme! All of the shops are listed below or above the item! Check out all the lovely shops!! You are sharp, and very clever. a BLT! (Blooming lily Treasury) @ Teri, I agree!